By Zhang Wei, January 1964. 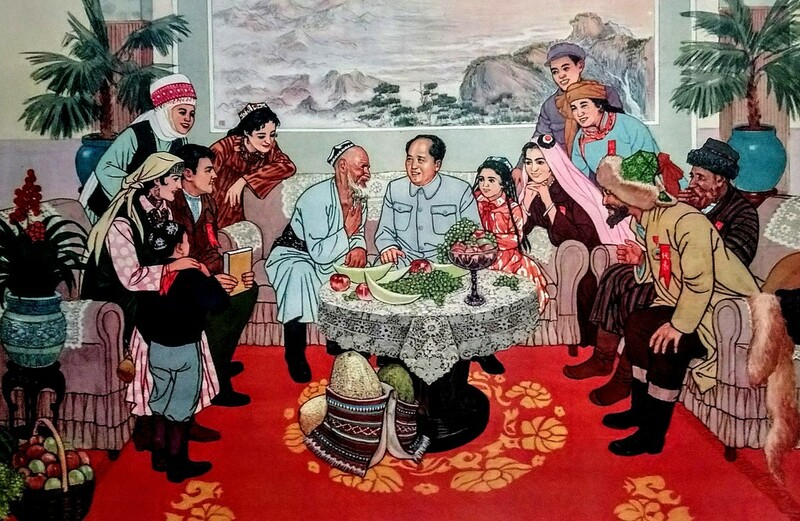 Picturing a delegation of Uyghurs meeting Chairman Mao at the exhibition of Chinese propaganda material at the William Morris Gallery. Very topical, considering what's being reported from China about the government's treatment of this Muslim ethnic minority in the country. a birthday present from the craft market and some cakes from the vintage fair. Very hard cycling back in the gale. Lunch of leftover pasta and lemon drizzle cake. Then a very busy afternoon - went through all the bags in the looking for stuff that might be useful for the Irish wedding. And with Dave, emptied and sorted most of the boxes in the spare bedroom. Had a bit of a rest then decided to have a go at the WiFi extender but just couldn't get it to work. So gave up and played a bit of melodeon. Dave made us fish finger sandwiches and salad and we watched the rather good Battle of the Sexes film.